On April 3, Universal Studios released the highly anticipated movie, Fast & Furious Seven or Furious 7, which rapidly made its way to the #1 spot at the box office. 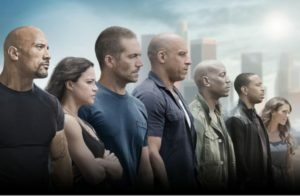 On just its opening weekend, Furious 7 made a total of $147.1 million and broke several records including: biggest April opening, biggest Easter opening, biggest opening of 2015, biggest pre-summer opening ever, ninth-biggest opening of all time, and the biggest opening in the Fast & Furious franchise, just to name a few. The movie continued to break other records that followed weeks after its initial premiere. As a follower of the Fast & Furious franchise, having grown up with two older brothers who introduced me to the series back in 2001, I was extremely excited for the release of the newest installation; more so after the untimely death of Paul Walker. I was curious, as were most fans, to see exactly how the cast and Universal Studios would handle the departure of its beloved protagonist. For those of you who aren’t familiar with the Fast & Furious plot, well, there isn’t just one. The plots are ever changing, although they do build on one another or relate to each other in some way. The first installment, The Fast & the Furious, follows undercover police officer Brian O’Conner, as he befriends ex-convict Dominic Toretto and his closest friends through street racing in order to gather more information on truck heists happening in the area. The subsequent installments follow the original cast through new adventures, with each new heist or plan bringing them closer together and make their family-like bond even more palpable. After going to see the movie on its opening weekend, I was left an emotional wreck by the end of the film. Even through the action-packed scenes, incredibly expensive race cars, girls in skimpy dresses, and the non-stop adrenaline that moved you from scene to scene, the film did an amazing job of keeping that sense of family and togetherness that has been a recurring theme from the first film to now. I was not even disappointed with how director James Wan and Universal Studios decided to tie up Brian O’Connor’s (Walker) final scenes. Despite all the wild rumors prior to the film’s release, it ended up being a beautiful display of Walker’s hard work and commitment to the franchise. My next question as a fan was: Is that it? Is the Fast and Furious franchise over? Rumors had already been surfacing on the Internet that Furious 8 was already in the works after Vin Diesel hinted that the next chapter would take place in New York during an interview with Jimmy Kimmel that took place on March 31, before Furious 7 had even premiered. On April 23 at CinemaCon in Las Vegas, Nevada, Diesel confirmed that Fast and Furious 8 was happening! He also announced that it already had an official premiere date: April 14, 2017. Even now, I’m still as excited as I was when I found out they were going to continue the franchise. While I know that the next installment will not be the same without Walker, I still think the film has potential and the cast has shown that they really are a family, on and off set, which is what has built and kept such a strong and supportive fanbase. If you have never watched the Fast & Furious series, I absolutely recommend binge watching it! Even if you don’t think you’ll be into the cars or action, you might find yourself, like me, waiting for that eighth film.